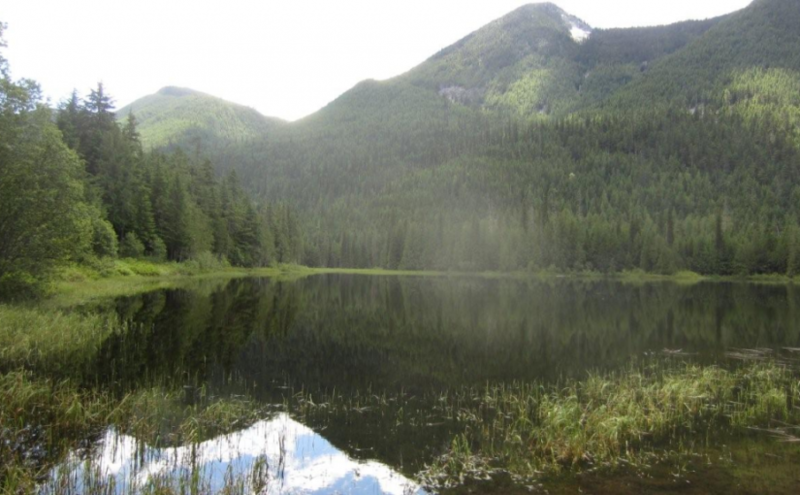 Cameron Lake is a popular fishing spot best suited to cartop boats and canoes. It is about 2 km long with an irregular, marshy shoreline and a mud bottom. The campsite faces east catching the early morning sun. Later in the day a mixed forest of mature trees shade the site. Driving Directions:Access from Arrow Park Ferry: At the ferry terminus set your odometer. Your odometer readings will not conform to the km signs on the road. 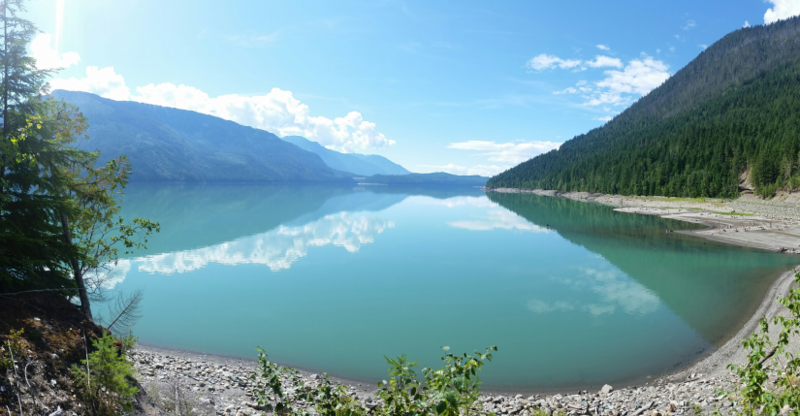 Within 200 meters of leaving the ferry, turn right onto the road marked “Saddle Mountain Road Revelstoke”. Follow this road, past the “Saddle Lookout” road, for 11.6 km to the junction with the “Low Pass Road”. Reset your odometer. Stay right following the lake on the “Blackie Rogers Road” for another 12.9 km to a major intersection marked “Fostall Point”, “Fostall Road”, “Blackie Road” and “Cameron Lake Road”. Turn left onto the “Cameron Lake Road”. Reset your odometer. Stay on the “Cameron Lake Road” for 6.2 km, passing “Branch 10” and other new roads. At 6.2 km the road forks again. This time take the right fork. The lake will be visible soon, as the recreation site is 1.8 km from this last junction. Alternate access from the Fostall Road: Cameron Lake can also be accessed from near the “17 km” sign on the “Fostall Road”. From the “Fostall Road” to Cameron Lake it is 5.1 km. This road has some steep, rough sections. A 4×4 vehicle with good clearance is recommended. 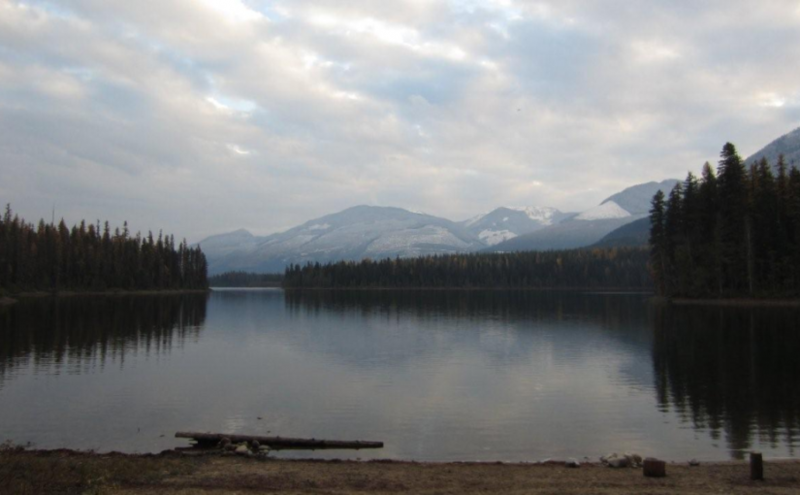 Catherine Lake is a popular fishing lake best suited to cartop boats and canoes. Camping is popular at Catherine too, with a choice of grassy or treed sites. Most of the campsites are quite private, being hidden along the shoreline amongst the trees. Each of the 4 campsite has a trail going down to the shore. Driving Directions: Access from Arrow Park Ferry: At the ferry terminus set your odometer. Your odometer readings will not conform to the km signs on the road. Within 200 meters of leaving the ferry, turn right onto the road marked “Saddle Mountain Road Revelstoke”. Follow this road, past the “Saddle Lookout” road, for 11.6 km to the junction with the “Low Pass Road”. Reset your odometer. Stay right following the lake on the “Blackie Rogers Road” for another 12.9 km to a major intersection marked “Fostall Point”, “Fostall Road”, “Blackie Road” and “Cameron Lake Road”. Continue straight ahead on the “Fostall Road”. Reset your odometer. Travel 5.2 km up the “Fostall Road” to a junction with “North Fostall Revelstoke”. Turn right onto the “North Fostall Revelstoke” road. Reset your odometer. Continue along this road for 3.6 km. At the junction with “Middle Fostall Road”, stay right on “North Fostall Revelstoke”.Travel another 2 km to a junction with “Vanstone Road”. Turn right onto “Vanstone Road” and proceed 4.2 km to the “17 km” road marker. Turn right onto a narrow, dirt, 2 wheel drive road. 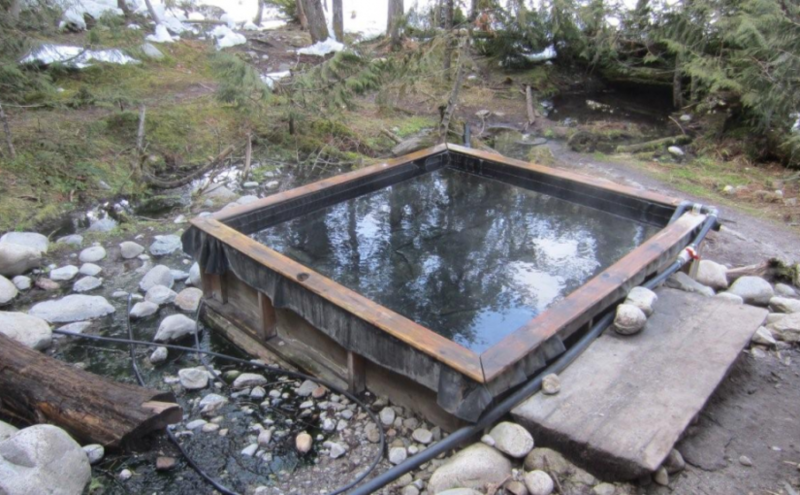 Travel 1.7 km to the Catherine Lake Recreation Site. This unique aquamarine coloured shallow lake makes a perfect mirror for the surrounding mountains and the forest edge. It is a quiet spot visited by loons and migrating water fowl. The 2 campsite tables are set on the edge of the lake in a small clearing. Driving Directions:Access from Arrow Park Ferry: At the ferry terminus set your odometer. Your odometer readings will not conform to the km signs on the road. From the ferry terminus travel straight ahead on the “Lower Mosquito Road”. Continue up this road for 6 km. Just after crossing the bridge over Arrow Park (Mosquito) Creek, turn right onto the “Branch 20” road. Follow this road for 3 km. At the junction with the “West Mosquito Road”. Reset your odometer continue straight ahead. Travel north on the “West Mosquito Road” for 11.6 km, to the “27 km” road marker and the junctions of the “West Mosquito Road” with the “Caribou Pass Road” and the “Fostall Road”. Reset your odometer. Continue straight ahead on the “Fostall Road” for another 1.5 km, just after the “20 km” road marker, turn right onto a dirt road. Follow this for 800 meters to the Larson Lake Recreation Site. 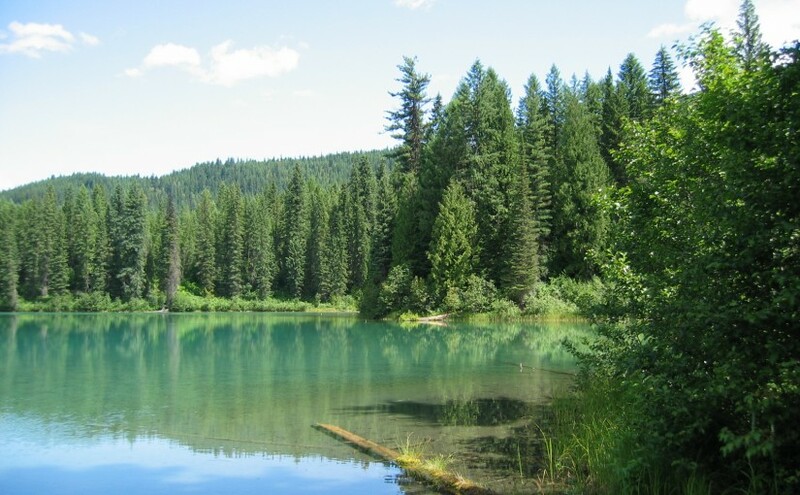 This is a perfect lake for exploring in a small boat or canoe. The irregular edge has several quiet little bays accessible only by water. The lake is popular with families as it offers good fishing and swimming. The Mosquito Lake Recreation Site is well located for a base camp to explore the area and visit some of the other lakes nearby. There are 3 campsites. Driving Directions:Access from Arrow Park Ferry: At the ferry terminus set your odometer. Your odometer readings will not conform to the km signs on the road. From the ferry terminus travel straight ahead on the “Lower Mosquito Road”. Continue up this road for 6 km. Just after crossing the bridge over Arrow Park (Mosquito) Creek, turn right onto the “Branch 20” road. Follow this road for 3 km. At the junction with the “West Mosquito Road” continue straight ahead. Reset your odometer. Travel north on the “West Mosquito Road” for 11.6 km, to the “27 km” road marker and the junction of the “West Mosquito Road” with the “Caribou Pass Road” and the “Fostall Road”. Reset your odometer. Continue straight ahead on the “Fostall Road” for 8.9 km. Between the “19 km” and “20 km” road markers, at the junction with “Plant Road”, turn left. Travel 800 meters to the recreation site.